Presented in 2011, the Titanium Bridge 3 days in titanium has established itself as a reference model, a signature watch blending aesthetic appeal and top- flight mechanics. Allying the precious nature of red gold with titanium, Corum has devised a new version of this exceptional model offering a contemporary interpretation of the Golden Bridge spirit. The horizontal baguette movement held by four ruthenium-coated bars excels in its role of epitomizing unique and absolute horological purity. 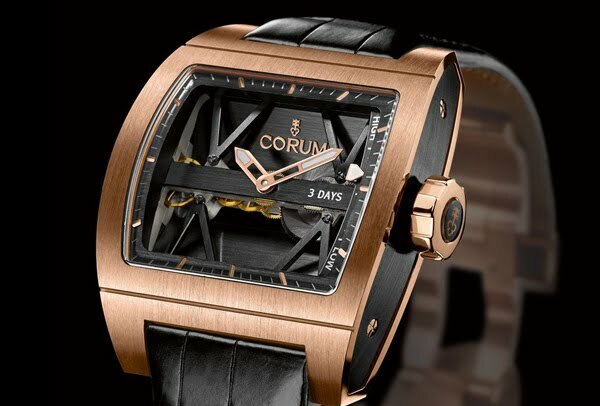 Corum is enriching its Titanium Bridge collection with a model that plays with materials in order to sublimate them. The sobriety of the red gold adorning the case makes a perfect match for the titanium of the hand-wound baguette movement, Caliber CO107. The association of these two materials is so powerful and so modern that it ideally combines with the architectural codes of the watch. Above and beyond their precious nature, the linearity and depth of the parts is further enhanced in this model. Red gold ennobles the watch from case to crown and creates a striking contrast with the titanium of the movement. The applied gilded logo and hour-markers embellish the dial, while the hour and minute hands as well as the power-reserve indicator are coated with luminescent material in order to be readable even in the dark. Fitted with a crocodile leather strap secured by a gold triple folding clasp with two safety pushers, the Titanium Bridge 3 Days is issued in a 50-piece limited numbered edition. Firmly in the forefront of a profession that it exercises at the peak of excellence, Corum continues to create ever more audacious watches – an approach perfectly exemplified in the red gold Titanium Bridge 3 Days. Design matches high technology as they jointly open up vast new horizons.